Government Polytechnic College was originated in the year 2010 with the intake of 300 students. Our main motto is Imagination + Innovation =Transformation. That means, if we release the locked potential in every youth, there is nothing that India cannot achieve. We, our General Engineering department faculties comprehend this fact and are in the process of building a young and vibrant team from the first year onwards. We provide enthralling environment with natural backdrop to make the classroom session much more interesting and effective to create up-and-coming engineers. For that, we have highly qualified, proficient and devoted faculties to help students succeed excellence in their academia by resourceful teaching. Our department has well outfitted workplaces, laboratories and Infrastructural facilities. The Physics lab has all standard equipments and apparatus for conducting the required experiments and prepares the students to fit into the engineering field. The various divisions of Physics like Mechanics, Electricity, Basic Electronics, Materials Science, Sound & Magnetism and Energy Physics etc provide the foundation by enlightening the fundamental facts, principles, laws and correct sequence of events to develop the Engineering and Technology field for the prosperity of human beings. 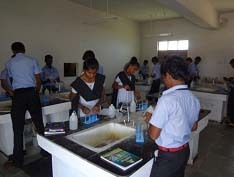 The main idea behind of our laboratory is to have knowledge about volumetric analysis in acidimetric, Alkali metric and permanganametric titrations and their applications to the students’, and also, to get knowledge about measurement of PH and to calculate Hydrogen ion concentration in a solution. At the end the students came to know about the harmful effect of the effluent and inorganic simple salt. Our department has a full-fledged workshop with separate fitting, carpentry, welding, wiring, smithy, sheet metal, and foundry sections. 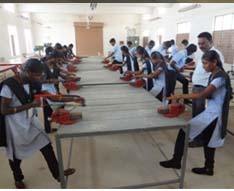 The objective of the workshop practice is the students will be able to acquire skills in basic engineering practice and identifying the hand tools .